We thought with all the recent blogging about funny news stories and unique toilets we could use this post to give you an update on our Community Giving Program. Last time we blogged about it we donated to the local West Hazleton Fire Department. With that being a huge success our next project was adopting a horse from Horses & Horizons Therapeutic Riding Center. 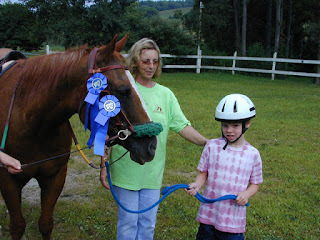 Horses & Horizons is a non-profit organization located in Tamaqua, PA. They are a therapeutic program for children and adults who have a wide variety of physical, mental, and emotional disabilities. The therapeutic riding center helps with coordination, balance, posture, attention span, concentration, speech, learning, and the forming of interpersonal relationships. This program is staffed by volunteers and owners, Harvey and Elaine Smith, who cover all operating expenses through fundraising and donations. Vintage Tub & Bath recently made a donation to the Adopt-A-Horse Program for this center and was named the proud parent of Monkey Biz, a 26-year-old horse who's been involved in the program since he was four years old. Looking to get involved? There are many volunteer opportunities and ways to give. This week, July 9th-13th, there is a Horses & Horizons Summer Day Camp and volunteers are needed! You can also donate any amount or even sponsor your own horse. And don't forget to check out Horses & Horizons on Facebook! I'm so excited by the thought of this opportunity. I'm a business owner and I am always looking for ways to help out the community. Of course, I don't live anywhere near Pennsylvania, so I have to ask if you happen to know if there's a Therapeutic Riding Center in every state or in every region? Or would the people at your center know if there's anything like this near to where I live? Also, I was hoping you could give me some more insight into how the process works for doing something like that. I've done donations and volunteering but never anything like that. I know the web site must have some good information but I always like to get some insight from the people who have actually gone through the process. Is it easy? What is the commitment like? I would really appreciate any insight you could give me into this. I would love to get involved. I really just think it's something that every business should take a minute to get involved in. Thanks for your question and your interest in such a great cause. In order to find out if there is a Therapeutic Riding Center near you; I would Google it. This way you can find if there are any centers near your home town that you can become involved in. I know Horses & Horizons is strictly located in the PA region. You can contact this center if you wish for more information. You can contact Harvey or Elaine Smith at (570-386-5679)or e-mail them at elshhtlc@ptd.net. They can help you with any questions or concerns you might have and their website offers a tremendous amount of great information. The center is made for children and adults and they use the horses to help them coordination, balance, and also interpersonal relationships. It is run almost entirely by volunteers and is very emotionally rewarding. Our CMO volunteers and our business also supports them financially through the adoption of a local horse at the center. It is easy to do, easy to set up, and is definetely rewarding. We think it is a great opportunity. Hopefully you can find a Therapeutic Riding Center near you and continue the support. Excellent idea, TRC!!! Here in our place, we have this so called ADOPT-A-THING. An organization may adopt a school, a tree, a community, or even a family. The adopted is then taken cared of by the foster parents. Foods are given weekly to adopted families and schools. For them to learn how to survive, they are also given regular workshops on various livelihood projects.